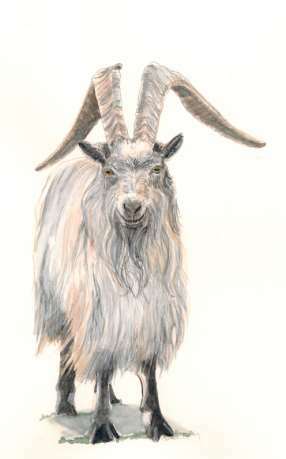 The Old Irish Goat is Ireland’s indigenous landrace breed, now critically endangered and only found in remote mountain ranges roaming in feral herds. Interbreeding with imported domestic goats has caused mongrelisation of the remaining breed resulting in major loss of the original the characteristics and adaptations. 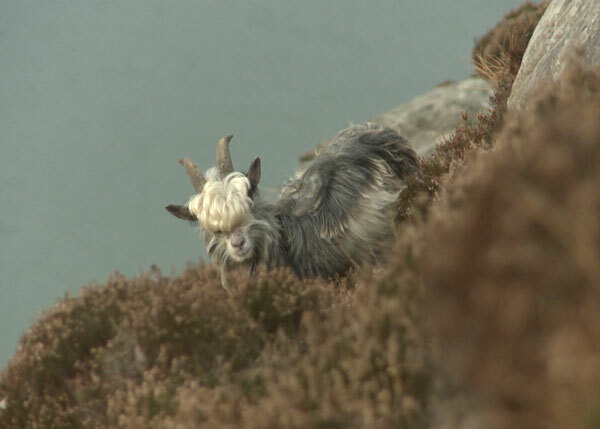 The Old Irish Goat is highly adapted to the Irish landscape and climate. 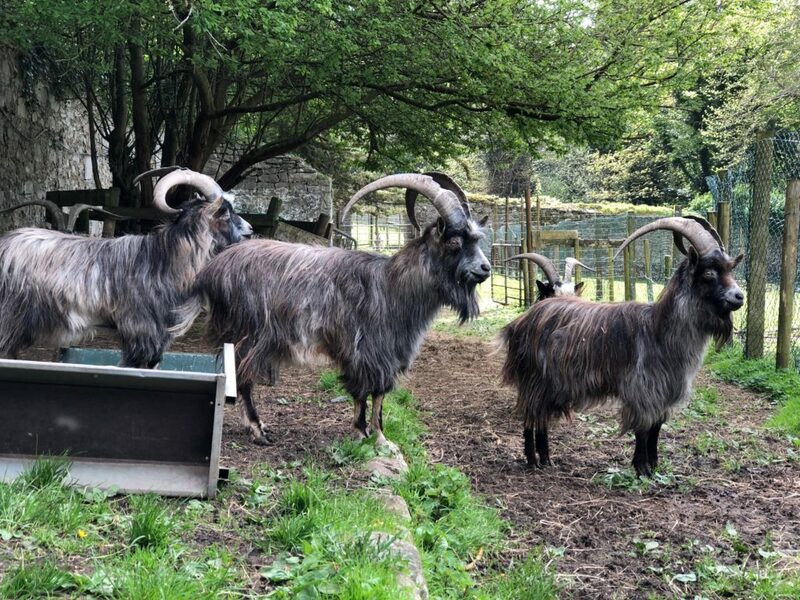 The males in particular are impressive animals, featuring – long hair, coiffs, beards and sideburns, and impressive horns. The females have a more delicate frame and a matriarchal role with their lineage being the social thread of the herd. Collectively these attributes make them a fascinating part of Ireland’s natural heritage. After arriving in Ireland during the Neolithic age, about 5,000 years ago, they adapted naturally to the Irish landscape over time. They seem to move differently to modern (improved) goat breeds due to their height to leg length which has resulted in a small stocky goat with short legs and a long body. Its ears are small and worn in a pricked position and its impressive horns are large, corrugated and bend over the shoulders in individual ways. These goats have no tassels and are always bearded. The male beard blends into the long-haired coat which is rough and thick and hangs down to the belly line in the male and long over the hips of the female. Being cold weather goats, they have an underwool of cashmere. They have 12 different colour patterns which give rise to the description ‘coats of many colours’. The numbers of remaining Old Irish goats in Ireland is not known, but they are extinct in domestication. 1. It was in England that the breed was first called the ‘Irish goat’. 2. The Old Irish goat was Ireland’s only goat breed until around 1900. 3. A thick cashmere undercoat under its long outer coat helps to keep the goat warm in cold weather. 4. It is possible to tell the age of an Old Irish goat by counting its horn rings. 5. Unlike the modern breeds of dairy goat, the Old Irish goat can be found in a variety of colours and colour patterns. 6. In domestication, the breed could give up to 200 gallons of milk a year. 7. Large numbers were once imported into England and Scotland annually, being called the ‘harbingers of spring’ as the drovers arrived in each town and village. 8. It is closely related to the native goat breeds of England, Scotland and Wales. 9. 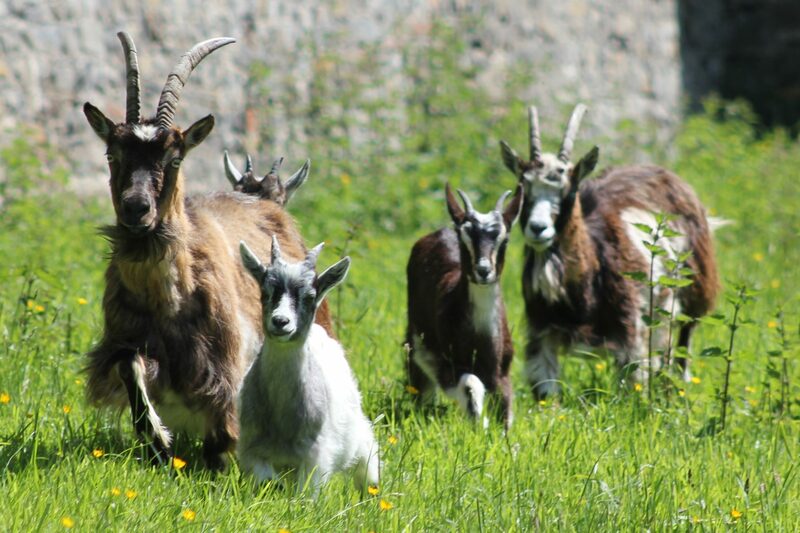 Feral herds of Old Irish goats are led by a female, the males forming bachelor herds for much of the year. 10. Now only found in the ‘wild’ feral state, the goats once caught, are easily brought back into domestication. 11. It has small ears worn in the pricked position. 12. There are no tassels (wattles) on the neck. It was the only goat breed in Ireland from the earliest of times until the beginning of the twentieth century when ‘improved’ breeds were brought in to Ireland. As the breed of the first farmers, it had a multipurpose use. It supplied milk, fat, meat, hide, hair and horn. It was present at the time of the building of megalithic tombs and it was the goat of Celts and Vikings. It found its way into Irish myths and legends and in time gave its hide to the Irish drum and parchment for monks to write on. It is certainly both symbolic and emblematic of Ireland’s history and often made the difference between want and starvation for the population during hard times, especially at the time of the famines. Large herds of Old Irish Goats were imported into England and Scotland during the nineteenth and early twentieth centuries. They were rounded up and taken north, up through South Armagh and on to the coast by drovers who ushered them on to Scotland, Wales and England. They sold the milk and nannies along the way as they proved to be a very popular hardy cottager goat. Their appearance in towns and villages often acted as a harbinger of spring. In 1908, there were around a quarter of a million goats in Ireland, practically all of which belonged to the Old Irish breed. Eighty years later, it was clear that they were heading for extinction in domestication and that the Old Irish base of the breed as a feral animal was being eroded away by introgression. As a native or landrace breed it could not be equaled as a hardy, cost-effective animal: ‘the poor-man’s cow’. However, goats of improved type – large, hornless, smooth-coated and better milkers – were imported from England at the end of the Nineteenth Century. From their main points of disembarkation (Dublin and Belfast), they moved across the country from east to west, replacing the old breed as they went. Goats of improved type (Swiss-based breeds and the Anglo-Nubian) reached the west of Ireland during the last half the Twentieth Century. 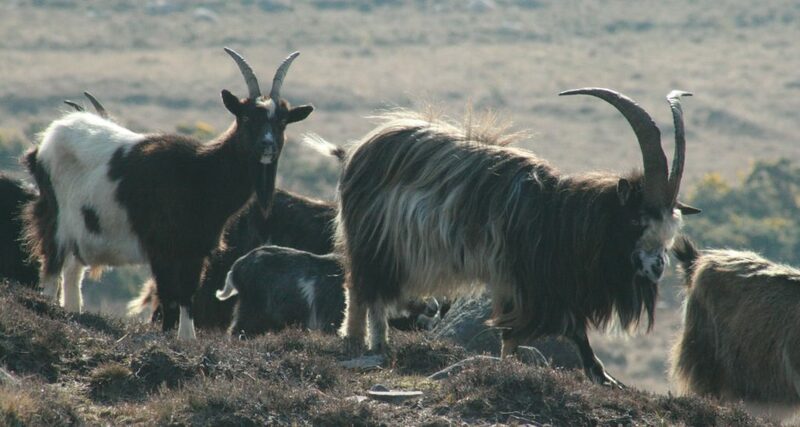 The numbers of remaining Old Irish goats in Ireland is not known, but they are extinct in domestication. They are now only found in scattered feral herds and numbers are declining fast. The World Watch List incorrectly classifies the Old Irish Goat as ‘not at risk’ while the latest edition of the Mason Dictionary declares it as ‘extinct’. Neither are correct, the Old Irish Goat is not extinct, but it is at risk and likely to become extinct in pure form in the very near future. Being an old landrace breed (shaped by the environment) it is hardier than the improved breeds and is of an invaluable genetic significance. It has traits which may be needed again when agricultural practice changes. It is the ideal smallholders goat and the best breed for land management and conservation grazing. Feral herds of Old Irish Type with their majestic horns and long hair, are vulnerable to trophy hunting. Indiscriminate culls and removal by farmers, further reduces the population. Introgression (crossing) with goats of modern type is dramatically changing and reducing the remaining few Old Irish goats left in the wild. There is a need to promote and publicise the breed to create awareness of the impending extinction, gain legal protection and safeguard what remains of the Old Irish type in feral herds.